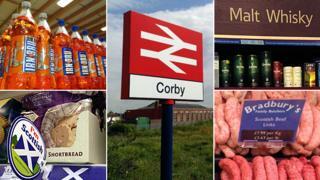 Is Corby the most Scottish place in England? Corby has been dubbed "little Scotland" ever since scores of Scots migrated south to work in the steelworks in the 1930s. On Sunday, the town's annual Highland Gathering will host their own mock independence referendum. But how Scottish is Corby? If you search Wikipedia for Scotland's southernmost settlement it comes up with Cairngaan in Wigtownshire. But the title has, at least in terms of repute, long belonged to the Northamptonshire town of Corby, more than 200 miles south of the Scottish border, in the heart of England. The rather unlikely association between this English town and Scotland began when Glasgow-based Stewarts & Lloyds constructed one of the UK's largest steelworks in Corby in the 1930s. Britons from all over the UK migrated to Corby in the steel rush, but a downturn in the Clyde Valley's steel industry led to a stampede of Scots. And they kept coming. By 1961, a third of Corby's population had been born in Scotland, according to the Census. With them came their Scottish traditions, dialect and culture. And also Highland dancing and bagpipes. And a love of haggis and Irn-Bru. Media captionWhat do people in Corby sound like? We asked nine people, with nine accents, to say nine words. It wasn't long before Corby was dubbed "little Scotland". But 35 years after steel manufacturing in Corby ceased, how Scottish is "little Scotland" today? About 12.7%, if 2011 Census figures are a good measure. It found that 7,765 of the town's population of 61,255 were born in Scotland. However, when it came to how the population described its national identity, 5,585 people in Corby said "Scottish only". By comparison, 33,018 people described themselves as "English only" and 10,299 people said they were "British only". But the census doesn't necessarily tally with local perceptions. Steve Ireland, 64, who used to work in a whisky factory and the RAF in Scotland, but is English and now lives in Corby, maintains the town is very much still a "mini-Scotland". "There's a huge number of Scots in Corby - first, second and third-generation Scots. And you can get anything here that the Scottish get - Irn-Bru, Scotch pies, square sausage. All you have to do is speak to people to realise most people have a link to Scotland," he says. Steve Noble, whose parents moved down from Glasgow in 1970 to work on the steelworks when he was 10 and is the landlord of the White Hart pub, agrees many families in Corby still feel Scottish. "I'm Scottish and my wife is from Aberdeen. My children were brought up with Scottish habits, my daughter used to highland dance. That's the template of the town - most families are like that. The Scottishness is diluted, but you identify with your roots," he says. Stroll around the town, and it doesn't stand out as particularly Scottish. There are chain stores and pound shops. Supermarkets and pubs. Cafes, chippies and a McDonald's. That could be anywhere in Scotland. But it could also be anywhere in England or Wales or Northern Ireland. But dig a little deeper, and there are signs of Scottishness. The most striking is the Corby accent, or mixture of accents. Some sound Glaswegian. Others seem to have a slight Scottish twang. And there are those that speak with a broad Scottish accent. Then there's the food and drink. Buckfast, Tennent's and Special Brew are all on sale in corner shops. Scotch pies sit on supermarket shelves. Almost every shop sells Irn-Bru (Asda says Corby consumes more of the fizzy drink than anywhere else outside Scotland). Bradbury's butchers sells everything from haggis and black pudding to Scottish beef links (sausages) and Aberdeen butteries (very buttery rolls with flaky pastry). "About 80% of everything we sell has a Scottish-based origin. We make our own traditional Scottish black pudding and haggis, fruit puddings, mealy puddings [white pudding] and Scottish potted hock [a kind of set pork dish]," says owner Gavin Bradbury, who was born in Corby but had Scottish grandparents. "A lot of the things that are north of the border are very popular with 90% of my customers - everybody in Corby has a real connection to Scotland due to the town's great sense of Scottish community," he says. Up the road, Caroline Murray, manager of the new Corby cafe, says she sells 70% more Scottish breakfasts - which include a square sausage, tattie scone and black pudding - than English breakfasts. "About 90% of my customers are Scottish. They love the mega big breakfast," she says. Most of the clientele at the Corby Candle pub next door are also Scottish, or Scottish descendants, according to 24-year-old Paul Fyfe, who works behind the bar. Some of the customers are in Celtic football shirts. Scottish ham and lentil soup is the soup of the day. What do people in Corby think about not having a vote in the referendum? Ian Brown, born in Corby, Scottish parents: "I think the vote should be bigger than it is. There are lots of English, Irish and Welsh that work a lot in Scotland who it will impact who should get a say." Robert Smith, 55, born in Glasgow, lives in Corby: "I feel sick that I can't have a vote. I love Corby, it's given me a job, a home. But I was born in Scotland. I want to go back there when I retire." Michael Walker, 29, born in Corby: "I'm from a Scottish family. I was brought up in Corby but I often work in Scotland. I don't think people that have lived in England all their lives have a right to vote, but I'm not sure how it would affect my work if Scotland votes for independence." James Lewis, 50, born in Scotland, brought up in Corby: "I don't think anyone that has been out of Scotland for a while, X amount of years, should have the vote - because how can we vote on somebody else's future when we are not part of that country?" "The pub doesn't do Sunday roasts. Everything in Corby revolves around the Scottish. The chip shop up the road will batter absolutely anything - Snickers, Mars Bars, pizzas, Creme Eggs, Chewits," he says. The town has more explicit Scottish ties. The Corby Trades and Labour Club, with Younger's Tartan Special on draught and old photos of Glasgow on the walls, is one such Caledonian encampment. The tartan-carpeted, saltire-saturated Grampian Club is another. The latter organises big celebrations for Burns Night, Hogmanay and St Andrew's Night and boasts its own pipe band. The town also has six highland dancing schools, according to Mark Pengelly, the Englishman who is organising the town's Highland Gathering and mock referendum on Sunday. "That's more than many Scottish towns with the same population as Corby," he says. Another sign of Corby's Scottishness is the number of Celtic and Rangers football supporters. "We've got second and third generation Scots walking around in Celtic and Rangers tops. More people probably go to watch them than watch the Corby Town football club," he says. Previously named Corbei, from "The By of Kori"
Corby's Scottish culture makes the town feel very different from neighbouring towns such as Kettering or Northampton, he adds. And yet Pengelly concedes Corby is changing. Asda used to have an entire aisle of Scottish food, but today the tinned haggis and Tunnocks' tea cakes share their display with Indian, Mexican and Polish products in the World Food Section. It's the same story in the new Tesco. The town, which in 2011 had 2,227 residents who were born in Poland - 3.6% of the population - also has a sizable Polish shop. Ian Brown, who was born in Corby after his parents moved there from Peterhead in 1961 for the building trade, believes the town is already a "mini city". "There are lots of multicultural roots in Corby. Welsh. Irish. People from former Yugoslavia came after the war. Now there are Polish, Portuguese. It's a massive multicultural population in Corby, it's not Scottish," he says. However, Pengelly isn't concerned that Corby's Scottish culture could become so diluted that it disappears. "There aren't many towns where you can go in to all the cafes, pubs and clubs and ask for an Irn-Bru, or ask for Scottish pies and haggis in your fish and chips, and hopefully that will continue forever," he says. Perhaps he should take some comfort from the experience of David Laird, who opened a new cafe called Picnic Lounge in Corby two months ago. "We started with unusual drinks - Duff beer, glass bottle drinks, flavoured crisps. But ultimately people from Corby want things like Irn-Bru, so we started stocking it and changed interesting crisp flavours back to salt and vinegar. And yes, Irn-Bru is one of our best sellers," he laughs.